Sculpted Contours is a Diamond Level CoolSculpting Center in Atlanta with an Expert Staff Including a Former CoolSculpting Trainer leading our team. As one of the Top Volume CoolSculpting Practices in the Nation (ranked 33 out of over 4000) you can trust our experience and EXPERTISE for the best CoolSculpting results. In addition, we have the best Prices in Atlanta. Why go anywhere else? CoolSculpting is a revolutionary proven fat freezing treatment which eliminates fat from your body naturally, safely, without surgery or any downtime. Best of all, the results are long lasting! You can freeze and ELIMINATE fat cells without surgery. Not only will a treatment of CoolSculpting reduce a treated area, but it will reduce the number of fat cells in the treated area. When fat cells are eliminated, they do not come back. With less fat cells to store fat, the areas treated are smaller, thinner and flatter than before treatment. CoolSculpting was developed by Harvard scientists, this FDA-cleared procedure uses a controlled cooling process to kill the fat cells that are under the skin, literally freezing them to death. This is performed by placing special treatment applicators on the specific areas you want to slim down. Each treatment takes 35 minutes to 75 minutes depending on the applicator selected that best fits your body. Once the fat cells are frozen, they naturally die and are eliminated from your body. Once they are gone, those fat cells do not come back. With proper diet and a healthy lifestyle the results you achieve with CoolSculpting are long lasting. We have every treatment applicator available including the newest CoolAdvantage technology applicators. Not every CoolSculpting Center chose to upgrade to this new technology so make sure you are choosing a center that has invested in the procedure so you get the best results. Having every available applicator really makes a difference and allows us to treat almost any person and almost any area of the body effectively with CoolSculpting. During your treatment at Sculpted Contours Luxury Medical Aesthetics, you can watch TV, work on your computer or tablet, talk on the phone or just unplug from the world and enjoy your own private luxury treatment room. Many clients even drift away and take a relaxing nap during their CoolSculpting treatment. How Does CoolSculpting Work To Reduce Body Fat? CoolSculpting can treat your abdomen, inner thighs, outer thighs, love handles, muffin top, saddlebags, bra line, back and arms giving you a slimmer smoother body in less time that it would take with a strict diet and intense exercise program…..and who has time for that? Every body is different and each of our clients has their own areas that concern them the most. We work with you to develop a customized treatment plan just for you. Our goal is to help you achieve the body of your dreams. Every single client has access to our talented experienced team, our our luxury center including all the little details so you can enjoy your time with us. The main goal is your results and giving you the best possible outcomes. Our CoolSculpting clients come from all over Atlanta including Dunwoody, Brookhaven, Johns Creek, Alpharetta, Sandy Springs, Roswell, Peachtree City, Inman Park as well as many states around the country. We are the go to Center in the Southeast for CoolSculpting. Sculpted Contours Luxury Medical Aesthetics was chosen by Zeltiq Aesthetics, the company that manufactures and sells CoolSculpting systems and treatments to practices around the world to be the FIRST CoolSculpting provider in Atlanta, GA to receive the new CoolAdvantage applicator. This new applicator is the BEST thing to ever happen to CoolSculpting treatments. There is no downtime with CoolSculpting. You can come in during the day and head straight back to work or even to the gym right afterwards. At Sculpted Contours we have FOUR CoolSculpting systems in one location. We can reduce the amount of time you need to treat multiple areas by treating them at the same time. Instead of treating one side for an hour and the other side for another hour, we can treat both sides at the same time! This allows you truly sculpt away your unwanted fat over a lunch hour! Sculpted Contours is a DIAMOND Crystal Level CoolSculpting Practice. Ranked as the highest volume CoolSculpting Centers in the United States. Experience matters! So, don’t be someone’s learning curve! Check out our information page to learn how CoolSculpting Practices are Awarded Crystal Designation Status by Zeltiq Aesthetics. You’ll understand why choosing an Expert center like Sculpted Contours Luxury Medical Aesthetics is the way to get the BEST CoolSculpting results. 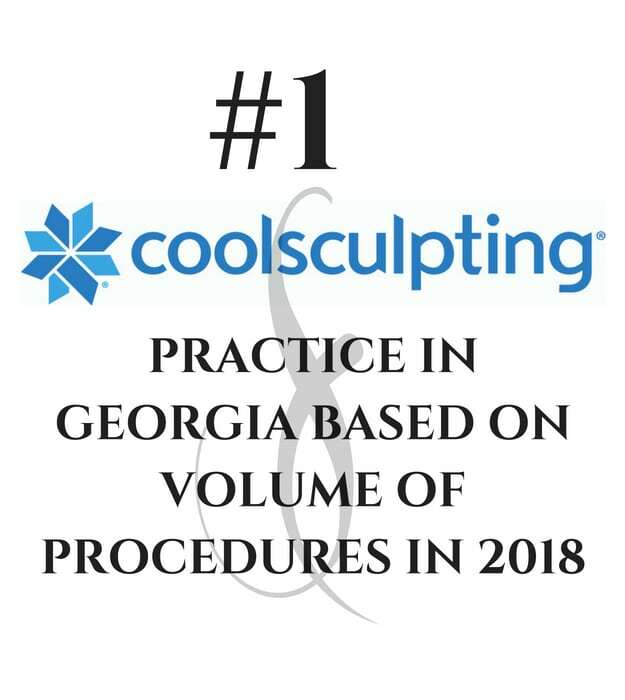 Sculpted Contours is the #1 CoolSculpting Practice in Atlanta and the State of Georgia based on Volume of procedures. We have a former CoolSculpting Trainor leading our team of experts. We are committed to helping you achieve the best CoolSculpting results. We also have everyday low pricing. Why would you go anywhere else? While not all desired results are attainable, once we discuss your desired outcome in your consultation and agree upon the expected outcome, we deliver. Our expert staff really know CoolSculpting and provide the most comprehensive treatment protocols. Remember, we even have a former CoolSculpting trainer leading our team and providing all our staff with the highest level of training every day. We take pride in your CoolSculpting results. Come in for your personal consultation and we’ll tell you all about our Contour Commitment, Costs, and how CoolSculpting can get you the body you want.